When importing files of select types that contain different units than the units of the current part, a dialog will appear to warn you of the mismatch. 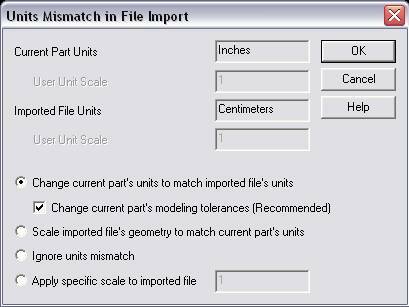 The Units Mismatch in File Import dialog allows you to specify how to handle the mismatch. The settings contained in this dialog are explained below. Displays the current part units (for instance: millimeters). User Unit Scale – Displays the user unit scale. In the example above, the scale is 1. This field displays the mismatch units, or, the units of the file being imported. When selected (checked), the units of the current part will be changed to match the units contained in the file you are importing. Change Current Part’s Modeling Tolerances – When Change current part’s units… is selected, this setting will become selectable. Click on the checkbox to change the modeling tolerances in the current part. When selected, the geometry contained in the file you are importing will be scaled appropriately to match the units of the current part. When selected, the units mismatched will be ignored, and no change will be made to the units of either part. When selected, you are able to specify a scale value to be applied to the geometry contained in the file you are attempting to import.